Restorative dentistry accomplishes exactly what the name implies: it helps to restore the teeth to a healthy state, allowing the patient the ability to chew with ease and providing a more attractive smile. Among the most common restorative procedures that dentists practice is the insertion of a crown. Indeed, crowns are found in a high percentage of the mouths of individuals who care about the state of their teeth and their oral health in general. Atlanta dentist Shelly Mixson, MD knows dental crowns. As a matter of fact, she specializes in both restorative and cosmetic dentistry, making her practice the place to go for a number of necessary and/or elective procedures. Trained at some of the best dental centers in the United States, Mixson offers state-of-the-art restorative treatment including the insertion of crowns of a variety of types, which are a logical solution for many patient’s dental woes. Often, the need for dental crowns is simply a result of normal wear and tear. Age can certainly have a detrimental effect on one’s mouth, but crowns can function as a long-term solution for teeth suffering from excessive wear. They can also aid in reducing the pain that results in eating with worn, decayed, or otherwise broken teeth and can restore a bright smile that has been long missing. Furthermore, today’s crowns look completely natural and most can be fitted and inserted in just two office visits. In addition, most dental insurance covers the purchase of crowns and the cost of the visits. However, the office staff at Gentle Smiles Dental are also happy to help determine solutions for manageable payment for those who are uninsured. Restorative dentistry under the supervision of Dr. Mixson is a pleasant experience. At Gentle Smiles Dental, the treatment methods used are state-of-the-art, the staff is congenial and well-trained, and the patient always comes first. 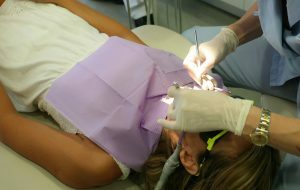 That’s important for those who are worried about experiencing the pain often associated with the insertion of crowns or other restorative procedures. For more information about crowns or other restorative procedures, browse our website or call the office of Gentle Smiles Dental and Dr. Shelly Mixson for more information.